There is a huge market of paranormal equipment out there, many promising amazing results. It's important to know absolutely no piece of equipment can scientifically detect ghosts! All are based on working ideas, which the paranormal community is actively testing. Any piece of equipment, including an app, that claims to detect ghosts is akin to someone telling you they have an app or piece of equipment that proves God, heaven and hell also exist. We scientifically do no have these abilities yet. With that said, many pieces of equipment out there are based on a variety of working ideas, such as ghosts give off various forms of energy. We as living beings are energy, our brain and nervous system are electrical. Where does this energy go when we die? On this page you will find some links to some mostly moderately priced equipment which you can easily and safely purchase through Amazon.com. While I may have not used these exact models and makes, I've used similar pieces in my own investigations. My overview here is brief of these pieces of equipment is brief, and I encourage you to do your own research into them and the principles behind their use. Additionally in the side bar are links to other reputable paranormal sites which sell a variety of other specialized equipment. Please feel free to email me if you have any questions about equipment. NOTE: Some Ad Blockers will prevent the Amazon links from displaying correctly, so text links to the same items have also been placed on the page. Simply pause your ad blocker on this page to see the fancier Amazon links. Many investigators believe ghosts give off electromagnetic energy, and using EMF, or electromagnetic field detectors can sense them. This equipment is the same that is used by contractors to detect power lines running through building walls and underground, so it's always important to realize where such sources are on an investigation as to not get a false positive. Many, including the ever popular KII meter, are so sensitive that your cell phone will set them off. Always evaluate your surroundings carefully when using these! From left to right are simple and inexpensive versions to more advanced and costly ones. Any basic digital recorder will work well for recording EVPs, and this includes the one built into you cellphone. Some more dedicated recorders have noise filtering abilities, and the ability to automatically fast forward recordings to when it detects any sound, eliminating the need to listen to hours of recordings from investigations. Here are a few of the flashier ones, and the Olympus is the one I use. When picking out an EVP recored you want to keep in mind that it has the ability to insert a memory card, and a USB connection is handy for transferring files easily to your computer. There are many cameras out there that have been modified to see into the infrared spectrum or the full spectrum. Full spectrum cameras are becoming the norm, and one of the most popular are modified knock-off Go-Pros. These cameras can see beyond what the human eye can see, and the belief is ghosts can be seen in these spectrums. This is why your dog or cat may bark at something you cannot see, but may be there. You will also need a good illuminator to make use of these in the dark. To see into the full spectrum you'll need a full spectrum light. Below I've linked to the Polaroid infrared light, which will only allow your camera to see into that spectrum. However it is the most powerful illuminator I've used to date and still a go-to for me in combination with others I own. Some of the more popular EMF meters and REM pods now have temperature sensing built in. However you can also use an inexpensive digital surface thermometer to get readings. The more popular, and expensive, Flir cameras show visual readouts of the temperature, along with where hot and cold spots are. However even these have dropped dramatically in price over the past few years. 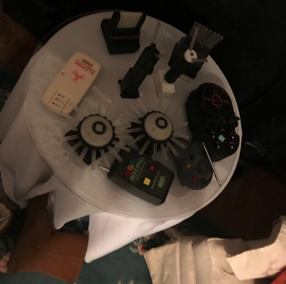 As seen on almost every paranormal show out there, the REM Pod and other similar pieces of equipment detect when something enters their field. The REM Pod reacts to something getting near the field it emits from its antenna, while the Periscope 360 reacts to static electric changes in the atmosphere around it. Both pieces detect interaction with different types of fields, so to speak, so using both together on an investigation is recommended. As with EMF detectors though, always critically evaluate your surroundings to determine what set one of these meters off. Humans and other natural fluctuations will cause them to go off! These are not the only types of these equipment, many different companies make their own versions at varying prices. Lastly is an EMF pump, which puts out an electromagnetic field. The idea behind this is that ghosts feed of this electrical energy, which is why on investigations people sometimes notice their batteries draining like crazy. An EMF pump is believed to attract ghosts to the area through this energy. Of course you don't have to spend a lot of money to communicate with ghosts, there are more old-school ways that many prefer over the new high-tech gadgets. Dowsing rods and pendulums work on a yes/no basis, with you asking questions that can be answered with a yes or no. Some people seem better at using these types of dowsing equipment than others, while others believe the actually work through the ideomotor effect. That is the person holding them is subconsciously guiding them and answering their own questions, which is how the Ouija Board is believed to work by many. Finally there is the SB-7 Ghost Box, also seen on every paranormal tv show out there. It works by scanning for white noise in between and across radio stations, which ghosts are believed to be able to use to communicate through, similar to the movies "Poltergeist" and "White Noise." You will want an external speaker for this, as the internal one built in is not very loud. It's always good to protect yourself on an investigation, and after, and there are many means of doing so. Carrying around a pendent, especially a blessed onr, of the religion of your preference is an excellent means of protection. Saging or smudging, which many Native American tribes practiced for ritual cleansing, can also be used to cleanse yourself, your house or any space. You can also create black salt from the ashes of the sage, which is an added layer of protection and cleansing. Carrying crystals is another believed method of protection, and you should always clean and charge them after each use. Leaving them out in the rain and sun is a simple way of doing this.